As my children get older, it becomes more challenging to find gifts for them during the holiday season. One unique idea is the [amazon_link id=”B00EQ7X8WU” target=”_blank” ]Beamz by Flo All-in-One Interactive Music System with Laser Beam Technology (120-1001/C1R42-AIO)[/amazon_link]. This interactive music system combines laser technology turning your iPad, iPod, or iPhone “into a full blown orchestra or band”. Branded by Flo Rida Beamz by Flo is a new interactive music entertainment product that provides an expanded way to experience, interact and immerse you in music. It’s not meant to replace traditional instruments or music-making, it’s all about tapping into the Mozart within. Billboard Artist Flo Rida is branding this signature product to help inspire people of all ages to enjoy making music that moves them. Connect with a PC, iPad, iPod or iPhone and you will have hours of fun. Fun For Everyone! 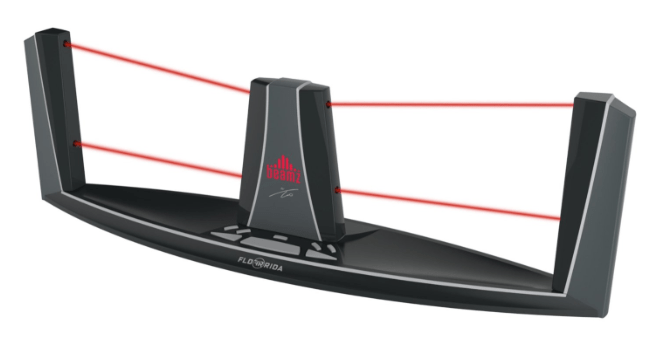 Targeted at the consumer market, Beamz by Flo features a slick, smaller footprint design with four laser beams that trigger a variety of instruments and sounds as you pass your hand through them. As you interact with the lasers, you can create a new destiny to any song played through the Beamz by Flo. I have my issues with Flo and his degenerative use of women in music videos, so the fact that this product is branded by him is not appealing. I don’t want my daughter listening to his music. There is a family bundle of music available, but I wish you could just use playlists you already have in your iTunes library instead o having to spend more money. Make music by moving your hands through laser beams with Beamz pre-programmed interactive songs. The Beamz controller lights up 4 red laser beams, and each interactive song has up to 12 different instruments for you to add into the playback of that song – so there’s lots of options for you to get creative. You can also record and capture your remixes to playback for yourself or to share with your friends. Manipulating the laser beams to create your own versions of songs is fun and cool, but unless you plan to have parties or DJ, I can see the novelty wearing off quickly, especially for the price. It didn’t hold my kids attention for very long, but they are used to playing real instruments. It is easy to play, and thus good for anyone who wants to dabble in making electronic music. For the person dreaming of being a DJ or mixing up sound, this would be fun. There is nothing eco-friendly about this product. « Why Should You Buy Baby Clothes Online?